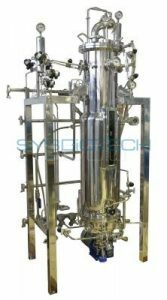 Sysbiotech pilot scale Gas-Fermenter was specially designed for the process of microorganisms cultivation in strictly anaerobic or facultative anaerobic conditions. In this process gas have to be carefully supply and control during cultivating. System has mass flow controllers on all inlet lines to optimize gas supply with accordance to metabolic needs of microorganism. Exhaust gas-line equipped with on-line gas analyzers for continues monitoring of gas-contents in exhaust gas-mixture. On-line sensors allow to monitor and control pH, DO, temperature, ORP, Optical density. Other sensors can be add by request. 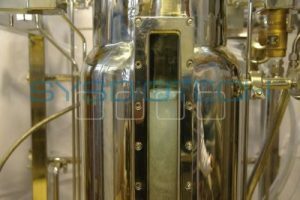 To achieve the best mixing conditions we offer different kinds of agitators like Rushton, marine or screw impellers, which can be use separately or in combination with each other. 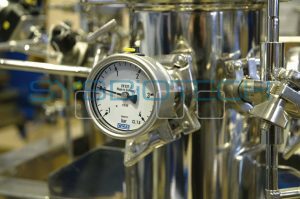 H/D ration up to 7 was specially developed to achive better conditions for dissolving of inlet gases into media. System can be designed for Explosion-proof conditions. 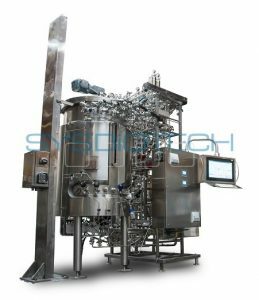 Controller system allows to manage and optimize cultivating conditions for CO, CO2, CH4 and another gases of fermentation process. Manual/automatic speed control depending on the amount of dissolved oxygen. Automatic massflow controller on all inlet lines. Mixing speed 30-600 RPM in standard execution, up to 1.500 RPM on request. Standard sensors: temperature, pH, pO2, pressure and foam. 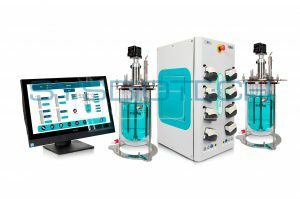 Sensors on request: optical density, ORP, level, weight, conductivity, pCO2, gas analyzers. Different sparger types: ring or micro spargers. Different specific designs are available on request. 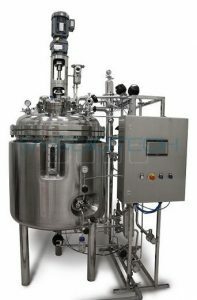 Special types of gaskets and sealing for strictly anaerobic fermentation. Adaptation for different gas mixture. Standard Ingold ports for electrodes. 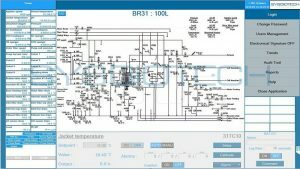 Simple and intuitive user interface that provides quick access to all controllers and data. “Sequences” program allows creating your own program of cultivation, which will allow better control of the process. All fermentation process data is gathered and saved in separate electronic records. 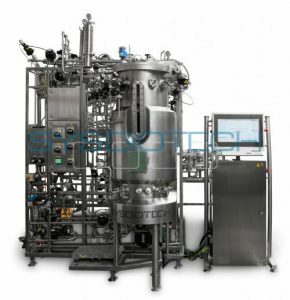 To minimize the number of errors, different bioreactor operators are given four different levels of access to control system.